The Snowday truck, and its parent group, Drive Change, are providing work training for a population with few opportunities. 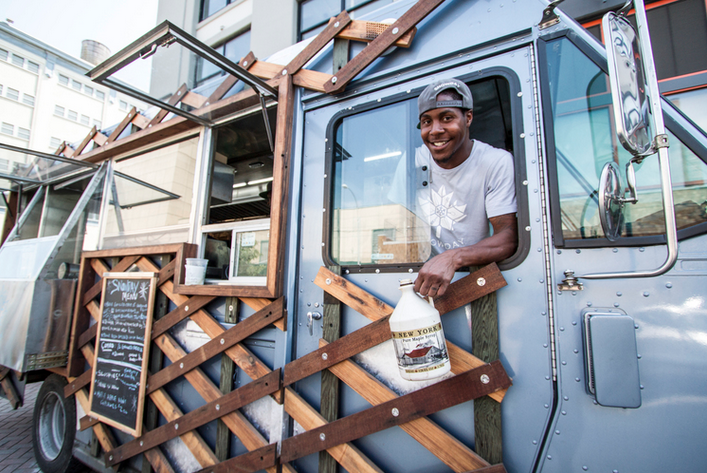 Snowday is the first of its kind: a food truck that sources its food locally and employs formerly incarcerated people trying to get back on their feet. The idea is to train employees in every possible job, from cooking to dish-washing to working the cash register; to give them courses in social media, marketing, money management, culinary arts, and hospitality; to get them licensed through the Health Department and the Fire Department; and then to help place them in full-time jobs or school. Jordyn Lexton, the founder of Drive Change, the non-profit behind the Snowday truck, says she has three goals. First, she wants to help people between the ages of 18 and 24 who have seen the inside of a jail or prison go on to live happy, productive lives. Second, she wants to build community around good food. And, third, she wants to use that community to educate customers about the criminal justice system. Before founding Drive Change, Lexton worked as an English teacher at the Rikers Island Correctional Facility’s high school. Rikers Island, a complex of ten separate jails, is notorious for brutality and violence; report after report has detailed appalling conditions there. This June, New York City Mayor Bill de Blasio committed to far-reaching reform efforts in a settlement. Thus, the idea for Snowday was born. Lexton quit her job, spent a year working on food trucks and in re-entry programs for the formerly incarcerated and another year fundraising and getting Drive Change off the ground. She officially launched the truck in April 2014. Snowday follows in the footsteps of other re-entry programs centered around subsidized employment and food, such as the Reconnect Café in New York and the Homeboy Bakery in Los Angeles. The programs all have the same goal: to keep participants out of jail. In New York State, about 70 percent of former convicts get arrested, incarcerated, or convicted of a new crime. Lexton hopes to bring that number down to 20 percent for the graduates of the Snowday food truck. “That’s extremely ambitious,” says Phoebe Potter, program director at the Council of State Governments Justice Center. The best programs manage to reduce recidivism (which, depending on the state, can include arrests, incarcerations, or only new convictions of former convicts) 20 or 30 percent. “Think about just how many barriers people face and really the ability of a singular program to possibly deal with all those issues,” Potter explains, ticking off a list: housing, employment, rebuilding family ties, finding a mentor, dealing with substance use, getting cognitive behavioral interventions for issues like anger management, and taking care of physical and mental health. Drive Change has informal partnerships with other reentry programs to try to provide access to some of those services. Of Snowday’s first 10 employees, three now work in food service and one works for the Metropolitan Transit Authority (MTA). One has gone back to college. Drive Change has hired four of them to stay on as mentors for future program participants. And the last one never really completed the program, because he didn’t have stable housing at the time. He’s still looking for a place to live and the situation prompted Snowday to add a new requirement: Applicants must have their housing figured out in order to participate. One of those who will stay on as a mentor is 24-year-old Darius J., who did not want to use his last name. Over the past year, says Jared Spafford, Snowday’s culinary arts director, Darius has begun to rent his own room for the first time and to pay for his first cell phone. At Snowday, Spafford sources 90 percent of the truck’s food from local farms. He has partnerships with two educational farms, which donate large portions of their crops to the truck. So, every week, he drops by to pick up whatever they have to offer—and he tries to use it all. Last year, he says, he made a lot of beet green pesto. Running a food truck is way more difficult than running a restaurant, he adds. (“I have to double down on my meditating to make it through the day sometimes,” he admits.) But the truck’s mobility is key to the organization’s third goal: educating people about the criminal justice system. Bringing the truck to a variety of neighborhoods means its employees can interact with people all over the city. During the five minutes between when people order their food and when it’s ready, the Snowday staff give out a criminal justice quiz for an opportunity to win a piece of Snowday apparel. The quiz includes questions like “What is the age of adult criminal responsibility in New York State?” (16) and “How much does it cost to incarcerate someone for a year?” ($160,000 is the answer they give, though studies have turned up a range of results, from $30,000 to $168,000). Those questions can be a starting point for a longer conversation. Now that the Snowday food truck has made it through its pilot year, Lexton will start hiring 20 to 24 young people every year, in two groups of 10 to 12. Her goal is to grow Drive Change to include not only the truck but also a garage and commissary—a commercial kitchen where other food trucks from around New York City could store and prepare food. That would have the potential to net between two and four million dollars a year, which would provide financial independence. (Snowday currently nets around $200,000 a year, which is a little less than a third of Drive Change’s total operating budget; the rest comes from donations and grants.) Furthermore, the trucks using the commissary to park, cook, and re-supply could hire Drive Change’s graduates, thereby multiplying the organization’s impact.